Provide some basic information about the new site. a. Pick a Template. By default, it is a blank template, with a simple home page and sitemp. The Template gallery offers a variety of themes for your site (including for Consortium meeting sites). You can leave the Blank Template option selected and add pages later. b. Name your site. Very important step: give your site a meaningful name. c. Confirm or change the Site location, i.e. its URL. The site name is spelled out automatically as the Site URL. You can modify it in the Site Location box. d. Select a theme. You can skip this step now and go back to selecting a theme later. e. Add categories and a site description in More Options. This helps you and other users find your site in cgxchange.org. f. Click on Create to confirm and proceed. 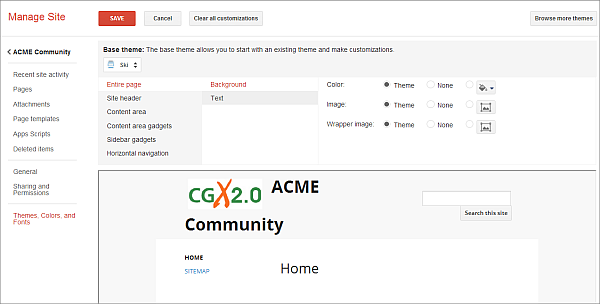 By default the CGX 2.0 logo appears on a new site, you can replace it with your Center or Program logo. Click on More ->Manage Site ->Edit Site Layout. Click on the Header to open the Configuration box. Select Custom logo and click on Choose file to upload your logo from your hard drive. Changing the look and feel of your site includes working on two areas. Site layout: modify the structural elements of the site: header, navigation, footer, side bar, site width. Themes, Colors and Fonts: modify the theme, color scheme and fonts across the site. Google sites offers a variety of page types you can create: Web page, Announcements, File cabinet, List and Start Page. The page editor features the standard formatting controls like bold, italic, underline, header and paragraph styles, text color, and text highlighting. You can create bullet lists, numbered lists, and easily link to other pages in your site and on the Web. Plus, you can embed a large variety of dynamic content, such as Google Docs, Presentations, Discussion Groups, YouTube videos, so as to create a handy central place for the information your group of collaborators needs. See this extended tutorial on editing a Google site for detailed guidance on page editing features. Note: this may take from a few hours to a day to be ready, so before publicizing your Site link, make sure you submit your request with sufficient advance notice. It is recommended that you write a short end-user guide or instructions to send by email to the people you plan to share the site with so they can learn how to sign in, how to browse the site and what is expected from them. We have prepared an End-User Google Site Template Tutorial in WORD that you can download and eidt to customize the instructions for your own site (please edit the areas in RED with your own information). You have two options to let your collaborators know about the Site you have shared with them. 1. Send a link by mail (safe option): at the top of the Sharing and permission settings page, locate the Link to share: select, copy and paste it in an email message that you will send to your collaborators, together with the Site tutorial you have prepared. 2. Notify people via email from the Sharing and permission settings page. You will be sending a notification with the link straight from your Site. Use this option when you are sure that your collaborators are already familiar with cgxchange.org, the Site instructions do not require an ad-hoc tutorial, and that your CGIAR colleagues have set up the mail forwarding in CGXchange. This ensures that they will receive the notification in their cgiar.org mail.